The ability to carry out the film “The doctor who refused to give up” is based at present completely on donations. This call started 2015-05-31 On the initiativ by members in HK. Donate to “ENBYFILM” according to any of the following choices. Write: Enbyfilm and your Name. 10 000 SEK / 1 081 EURO to start production of the trailer June 17. We reached that sum June 7 that is within a week from launching the project. We will try to get presales from Broadcasting Companies and support from Institute. 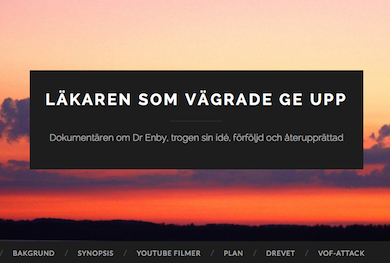 55 min documentary is 656 040 SEK /70 877 EURO. We succeded to reach the goal in Decembre of 2015 and the again the film turned out to be 100 minutes instead of 50.